Tacloban City — Foodie Haven | Tell Me… Am I From This World? I was in Tacloban on September 14-17, just wanna get out of the busy city for a while. I was supposed to be with my sister Mimie but she didn’t join due to some prior commitments at work. Before coming to Tacloban, I already read some information about the city and since I love food, I also looked for good places to eat.. I wasn’t disappointed because Tacloban is a foodie haven. They got places worthy to visit — from family diners, cosy cafés to exquisite cuisine restos. So, that added to my excitement. When I arrived there, I didn’t know anyone or any place to go. I had my lunch in a mall, at Shakey’s. Just wanted to have a quick lunch so I decided to go there. I had a Chicken ‘n Salad plate, House Blended Tea and Banana Split for my dessert. It was such a wonderful lunch. Yum yum. 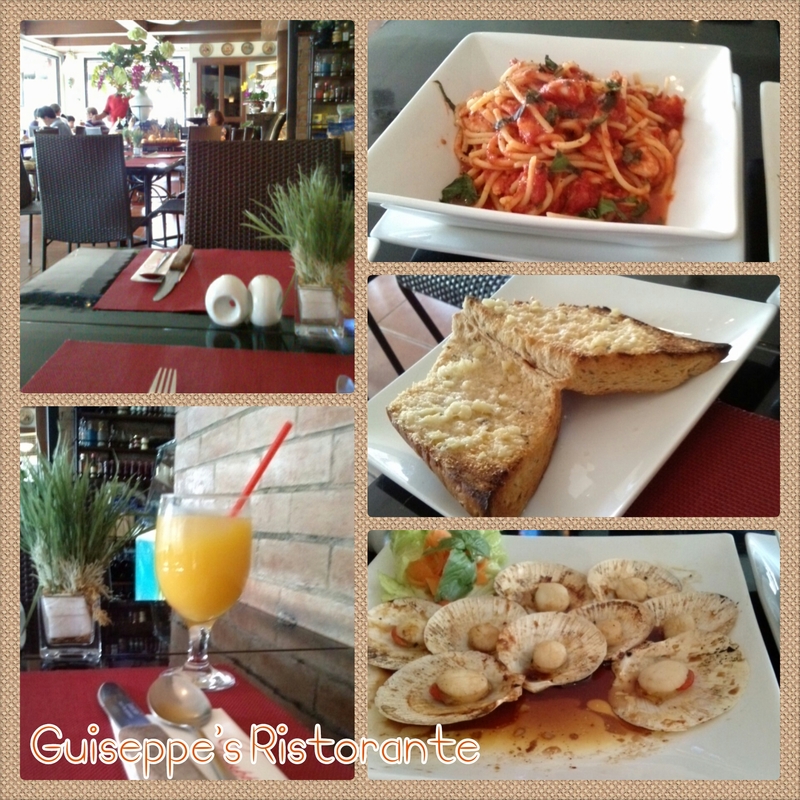 The following day, I had my lunch at Guiseppe’s Ristorante because according to reviews, this is one of the best in Tacloban owned by a Filipina and Italian couple. So we can be assured that they are serving authentic Italian dishes. I ordered Baked Scallops (Php150), Seafood Marinara (Php250), Garlic Bread (Php50) and Mango Juice. The pasta is almost good for two people and the taste is heavenly! Even if I’m not used to big servings of food, I managed to finish it! Baked Scallops would always be my favourite anywhere I go.. I liked theirs but maybe was a little bit salty for me. Garlic Bread was crunchy at first bite but as you continue on, the softness and flavour of the bread were just blissful. Though my lunch on that Sunday afternoon was a little bit pricey, I was happy because of that wonderful gastronomic experience. 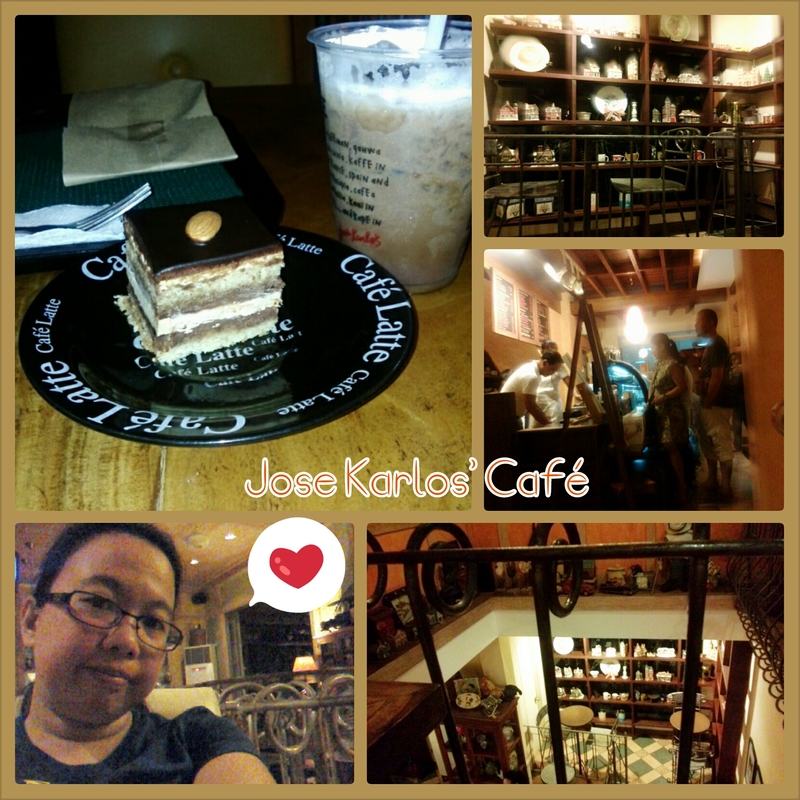 The ambience of the place is classy yet homey and I even got to connect to Facebook because of their fast Wi-Fi access. All-in-all, I loved it. I always love coffee.. I love Starbucks so much I can have as much as four Hot White Chocolate Mocha in a day. Hehehe. When I was in Tacloban, I was looking for Café Urbana, a coffee shop that also serves full meals. Their address said Sto. Niño Street so I left my hotel around 6PM just to be on time for dinner. I was planning to have coffee after a light meal and just chill around. I walked along Sto. Niño Street as well on the next street but I couldn’t find Café Urbana. I asked locals but they were not familiar with it too.. I knew that it may be hard to look for as it was mentioned online that it is just a hole-in-the-wall, but I didn’t expect that all locals I asked, they were unaware of its whereabouts. I even rode a tricycle and the driver, an old man with his wife, helped me looked for it until they told me to try Jose Karlo’s Café in front of the Church. They said their daughter is working there and it’s a well-known café in the area. Actually, I’ve read about the place too and has good reviews but I was planning to go there the following day. I decided to just go in and try their coffee and sweets. I ordered Iced Mocha (always love mocha!) and a slice of Almond Ganache. I noticed that the place is so cosy. The place is filled with collectibles like a Christmas Village and some toys that I think were from overseas. Easy listening music was playing in the background and you’d feel you want to stay there forever.. The only concern for me then was that they didn’t have Wi-Fi access when I checked it. I don’t know if they really do have but was just down or didn’t have it all. I liked the iced coffee and the cake and cosy feeling the place gave but I was already really hungry and I needed something heavy. I asked the locals at the other table if they knew Café Urbana but again, to no avail. They told me that there’s a good place just a few meters from there and they highly recommend it. I walked my way going to Uncle Sam. It was just around the corner from Jose Karlo’s and I didn’t lose my way as the place was quite noticeable from afar. Once you entered it, you’ll know that it is a family restaurant as the place has this comfy ambience. The walls were decorated with film posters and lit well enough. Also, it is child-friendly that parents can bring their kids to have their lunch or dinner there. I was surprised with the prices when the waiter handed me their menu. I was expecting a higher price for the food as they are known to serve steaks and burgers, but their prices are affordable. 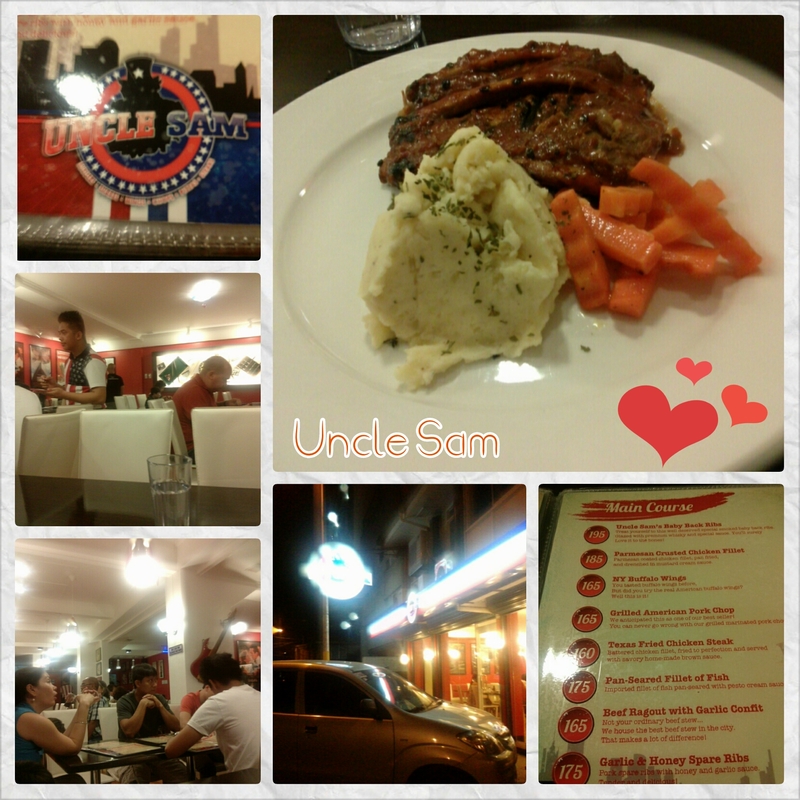 I ordered Uncle Sam’s Baby Back Ribs (Php195), changed the rice to mashed potato (+Php25) and Twinings Peppermint Iced Tea (Php85). I loved the Baby Back Ribs, the meat was tender and succulent.. Yum yum! The mashed potato was good too and the consistency was just enough for me. The tea was rich in flavour as well, for some, they may not so like the leafy taste of it, but for me, that’s how a real tea should be. I enjoyed my dinner and felt so full for just Php305 on my bill. Hehe. Loved Uncle Sam. 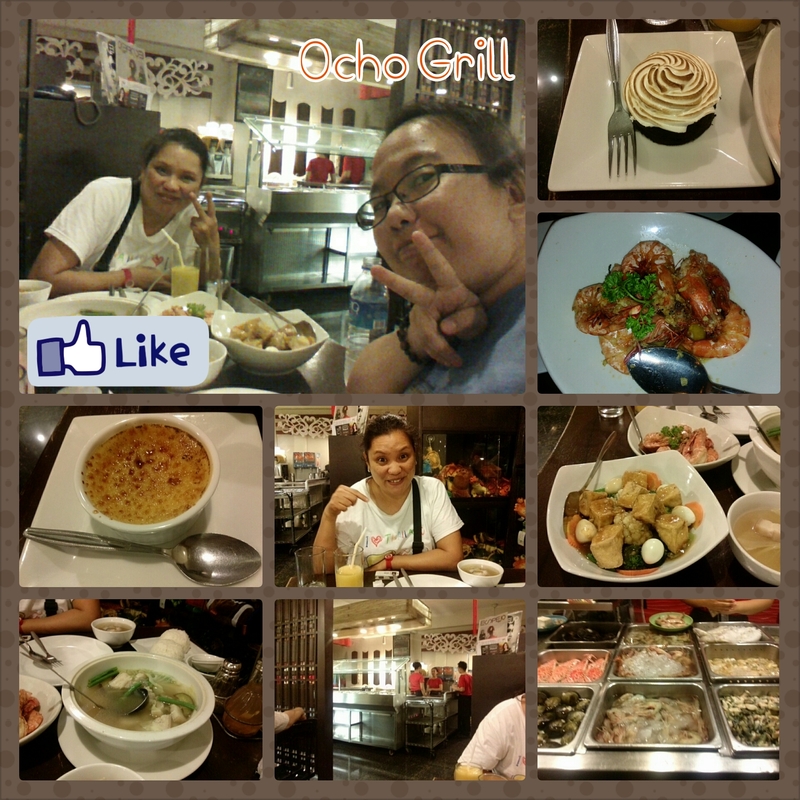 On my last day in Tacloban, I met up with a good friend and she recommended that we should eat at Ocho Grill. A restaurant where you will be the one to choose the ingredients and tell them how you wanted it to be cooked. Both of us wanted some soup so we requested Pork Sinigang for Php140. Then, we also had veggies and cooked it as Chopseuy with quail eggs for Php135. We also had Buttered Prawns for Php187. Two cups of rice, Mango juice for her and Watermelon Shake for me. She had an Oreo Fudge Cake and Crème Brûlée for me. Our bill was around Php900 but we were so full and the cooking was great!! My overall gastronomic experience in Tacloban was superb and I’ll definitely go back and enjoy other places the city has to offer when it comes to food. Previous PostSpark, Magic and Love…Next PostRemembering Mama..